The Well-X-Trol WX-255 well tank delivers unparalleled performance and longevity, making them the most recognized brand on the market. With its sealed air charge and unique water chamber design, Well-X-Trol is the choice of professionals. WX-255 now comes standard with Tuf-Kote indoor/outdoor coating technology. This coating allows the well water storage tank to withstand the harshest environments, giving you years of worry-free service. NSF Standard 61 Listed. The Well-X-Trol WX-255 well tank features a heavy duty butyl diaphragm and a virgin polypropylene liner which ensure the potable water never makes contact with metal objects. Stainless Steel Connections. The Well-X-Trol WX-255 well tank uses stainless steel at the air stem, and inlet/outlet connection points. 7 Year Manufacturer Warranty. 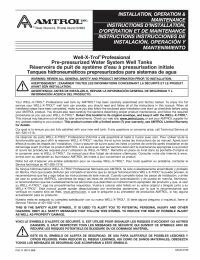 The Well-X-Trol WX-255 well tank has one of the best warranties in the industry. 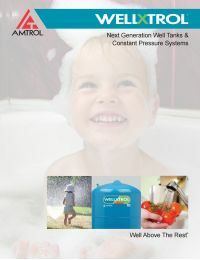 Amtrol well tanks are expected to work in the harshest environments and their warranty is there to back up their claim.